During warm summer months, handling characteristics of WEST SYSTEM Epoxy will be different than at other times of the year. Our cure times are based on an ambient temperature of 72°F, but in warmer temperatures the epoxy will cure faster. There are some steps you can take to ensure good results when using WEST SYSTEM Epoxy in warm environments. Epoxy cures by a chemical reaction between the resin and hardener that releases heat, called an exothermic reaction. The larger the volume of epoxy the more heat that is generated. Many epoxy users have seen pots of epoxy uncontrollably exotherm. The good news is there are some things you can do to prevent this. A good rule of thumb for gauging cure speed is that for every 18°F increase above 72°F, the working time and pot life will be cut in half. To maximize the working time of the epoxy, consider how much time you need and what temperature you’ll be working at, then select the hardener accordingly. The pot life on the WEST SYSTEM technical data sheets refers to a confined mass of 100 grams of epoxy at 72°F. Pot life is always shorter than working time because epoxy contained in a pot kicks off faster than epoxy spread into a roller pan (thin film). Spreading out the epoxy extends working time. Select either the 206 Slow or 209 Extra Slow Hardener for best results in warm temperatures. To maximize working time (and minimize waste), mix a batch size that you can use within half of the pot life. With 206 Slow Hardener that would be 10-12 minutes and for 209 Extra Slow Hardener it would be 20-30 minutes at 72°F. This approach lets you continue using the same mixing pot, mixing stick and roller cover or glue brush. The 300 Mini Pumps meter approximately 1 fluid ounce per pump stroke so you can mix small batches quickly and accurately. After thoroughly mixing resin and hardener, pour the epoxy into roller pans or onto the substrate. This increases surface area so heat buildup (exotherm) can dissipate, slowing the epoxy’s reaction. 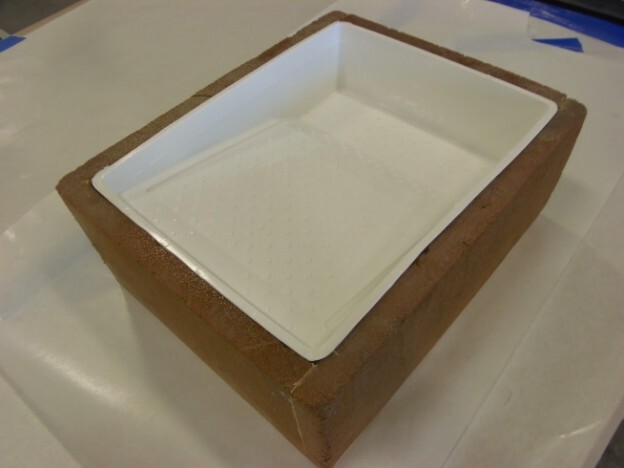 To slow epoxy’s reaction in very warm temperatures, create a foam box that is glued together and sealed to hold your roller pan as shown in the picture. Fill the inside of the foam box with tap water that will act as a heat sink and increase epoxy’s working time. An ice cube or two can be added as long as you do not chill the epoxy too much. Chilling the epoxy too much can cause moisture in the air to condense on the epoxy. The moisture can cause the epoxy to cure at a faster rate, become cloudy and reduce its cured physical properties. Foam box holding water and a roller pan to help cool epoxy and increase working time. Wet out the surface with neat (unthickened) epoxy. Apply epoxy thickened with high-density filler like 403 Microfibers, 404 High-Density, or 406 Colloidal Silica. Wetting out the surface with a thin coat of neat epoxy will help ensure that it has contact with all the nooks and crannies before the epoxy starts to cure. The thin coat of epoxy will cure more slowly and have time to effectively wet out the surface. The thickened epoxy is applied to bridge gaps, and should be applied last to the places with the largest gaps (requiring more epoxy volume) to maximize assembly time. To monitor the cure process from each batch, pour a small sample into a container to see how fast the system is curing in thin film. “Controlling Exotherm” by Mike Barnard in Epoxyworks 39 covers managing exothermic reaction when working with large quantities of epoxy. This entry was posted in Materials Testing, Techniques & Tips and tagged #42, Don Gutzmer, Epoxyworks #42, exotherm, Spring 2016 on February 26, 2016 by ewadmin.